The Moon moves into Cancer at 10:26 AM EDT until Sunday, April 22, 2018 at 1:09 PM EDT. This morning the Moon moves out of Gemini and into Cancer, which means the Moon will be Void of Course today while the Cancer Moon is getting comfortable in its new digs. The Moon naturally rules the sign of Cancer, so it is pretty comfortable in this placement anyway. It's important to remember that the Cancer motto is, "I feel therefore I am." This energy needs to be channeled intuitively rather than allowing emotions to fester and rain on everyone's parade. This Cancer Moon can get itself worked up and emotional so easy, while at the same time taking everything just about as personal as it can. This energy is so intense that it can easily develop a martyr-complex. Again, if feelings, moods, sensitivities and emotions are going to be so sensitive, then use this energy to develop your intuition. I seriously doubt God created this energy for us to take everything way too personal. There are three (3) lunar aspects present as the first aspect impacts the Gemini Moon and the second and third aspects impact the Cancer Moon. See aspects listed below. We begin the day with two (2) sextiles to the Moon, which is friendly, easy and comfortable energy. The Moon sextile Uranus gives us a progressive and inventive take on Life. We are prone to making quick decisions and trying new things without too much forethought. "Oh hell, why not!" says our brain. This aspect also gives us a high degree of intuition, and hits before the Cancer Moon presents itself. The second aspect is the Moon sextile the Sun, which is a wonderful balance between male and female energies, and the mother and father energies. You may receive the sense that it is just time to move on, and what once was . . was . . . . but is no longer. The last aspect to occur is the Moon square Mercury, which makes it hard to communicate and say what is on your mind. There is a brain-block of sorts, which makes it difficult to make up your mind. You may find it difficult to even place your order at a restaurant. This is because the feelings (Moon) and thoughts (Mercury) are at odds. You or someone close to you may be harping on trivial details when they really are unimportant. WHO CARES! 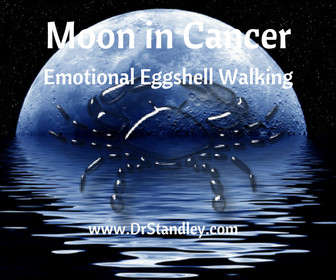 And no, it is probably not 'the principle of the thing' . . you may just be looking for an argument or another reason to stay mad because you are being so emotional due to the Cancer Moon. A hard aspect to the Moon (like this) can easily create a pitiful martyr complex. Ask yourself what is the payoff and maybe that will help you let go and let God. Download the 'Moon Sextile Uranus' chart wheel here! The Moon in Gemini sextile Uranus in Aries at exactly 8:05 AM EDT. You will feel this energy within 12-14 hours 'before and after' it occurs. The Moon moves out of Gemini and into Cancer at 10:26 AM EDT until Sunday, April 22, 2018 at 1:09 PM EDT. The Moon in Cancer sextile the Sun in Aries at exactly 11:16 AM EDT. You will feel this energy within 12-14 hours 'before and after' it occurs. The Moon in Cancer square Mercury in Aries at exactly 8:42 PM EDT. You will feel this energy within 12-14 hours 'before and after' it occurs.